Today we welcome Kimberly Truesdale to talk about her novel My Dear Sophy, which is the story of how Admiral and Mrs Croft came to be. Be sure to enter for a chance to win a copy for your Kindle. Giveaway open internationally. Thank you for having me, Dark Jane Austen Book Club! I hope you are enjoying your month of reading Persuasion. It is my favorite Jane Austen novel for a number of reasons, not the least of which is that it features a “second chance” story and a man in uniform! Since I first read it, I’ve been a little bit obsessed with the story. So when I thought about writing an Austenesque novel of my own, I gravitated toward Persuasion. When I start talking about my love for the novel, I usually get asked why I chose to tell the story of Sophia Wentworth/Croft and not the story of Anne and Frederick? After I get over my perverse pleasure in simply saying “Why not write about Sophy?”, I actually do have a few good reasons to choose her. No one else has written about her. At least this is true to the extent that my internet and library researches can prove. If you are familiar at all with Austenesque fiction, you will know that authors largely gravitate toward Pride and Prejudice, down to the minutest secondary characters and variations on the story. When it comes to Persuasion, authors have written some about Captain Wentworth (*swoon*) and Anne Elliot, but just haven’t gotten to too many of the secondary characters. I saw an opportunity too good to pass up. I like atypical female characters. Always have, always will. And Jane Austen makes a point of showing in Persuasion how Sophy has traveled the world and been right there doing all the things her husband does. She is a “strong female character” whose story I could picture the most clearly. In many ways, I think Sophy is the most “modern” of Jane Austen’s characters, in that she would fit right into the 21st century. Sophy & the Admiral have one of the few successful marriages in Austen’s fiction. By “successful” I mean that they are happy and working together in partnership. Think about the main characters in Austen’s novels. Most of the happy couples we see — Darcy & Elizabeth, Captain Wentworth & Anne Eliot, Edward & Elinor, etc. — come to feel a kind of partnership with each other. While they might not be social equals, they feel equal in their relationship. Many of the secondary relationships don’t feel this way — Mr. Collins & Charlotte Lucas, Wickham & Lydia, Mr. & Mrs. Bennet, Mary Elliot & Charles Musgrove, etc. Yet Sophy & the Admiral are explicitly described as being equals. But by coolly giving the reins a better direction herself, they happily passed the danger; and by once afterwards judiciously putting out her hand, they neither fell into a rut, nor ran foul of a dung-cart; and Anne, with some amusement at their style of driving, which she imagined no bad representation of the general guidance of their affairs, found herself safely deposited by them at the cottage. In a world where men and women were not expected to be equals, the Admiral and Sophy truly are. An unusual man. Not only do I love Sophy Wentworth as a strong female character, I love the Admiral. As you can read from the passage above, he has not the slightest issue with his wife correcting his driving. It seems that this is such a usual occurrence that the Admiral doesn’t even notice it! And the fact that he allows his wife to travel on board ship with him as an equal is even more intriguing. This is a time when women were not welcome (or even technically allowed) on British naval vessels. I wanted to write about this unusual man just as much as I wanted to write about Sophy. I have crossed the Atlantic four times, and have been once to the East Indies, and back again; and only once, besides being in different places about home — Cork, and Lisbon, and Gibraltar. These are exciting possibilities! I love history and so the opportunity to research this era, especially all the exotic places Sophy & the Admiral may have traveled, is irresistible to me. A female Horatio Hornblower. To continue on from the last point… there is so much to write about! Many authors (the most famous of whom are all male) have written about this time from the perspective of a young man. I want to write about it from the perspective of a woman. There are a lot of things that adding in another gender might reveal about this time period. I love the idea that Sophy is a swashbuckling woman! What do you love about Persuasion? If you wrote a novel about your favorite characters, who would you write about? My Dear Sophy on Amazon for Kindle and paperback. Bio: Kimberly Truesdale is a writing and literature teacher who has a line from The Great Gatsby tattooed on her arm and has worn out at least five copies of Anne of Green Gables. 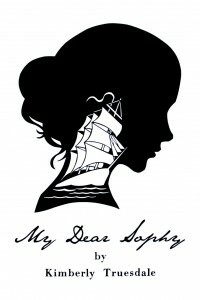 In July of 2012, Kimberly published her first novel, My Dear Sophy, about how the Admiral and Mrs. Croft from Jane Austen’s Persuasion first meet. Her most recent book is The Wrong Woman, a tender Regency romance about an atypical heroine and the hero who comes to love her. Follow Kim on Twitter @playsthetart or Facebook at Author Kimberly Truesdale. Word Warrior, Coffee Lover, Ravenous Reader, Practitioner of the Mommy Way , and Knower of Unusual Things.